Joel A. Tarr studies the environmental history of cities and the history and impact of their technological systems. He is particularly interested in using history to understand contemporary problems. 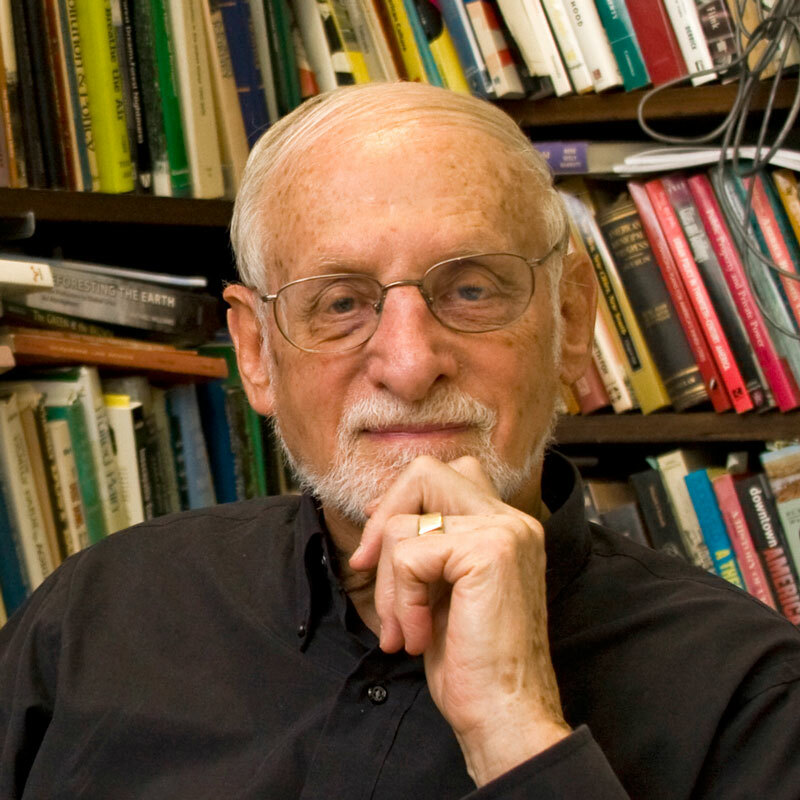 In 1992 Carnegie Mellon University awarded him the Robert Doherty Prize for Contributions to Excellence in Education, and in 2003 he was elected a University Professor. In 2008, the Society for the History of Technology awarded him its highest award, the Leonardo da Vinci Medal, presented to an individual who has made an outstanding contribution to the history of technology. In 2014 the American Society for Environmental History awarded him its Distinguished Service Award for 2015. His book, Technology and the Rise of the Networked City in Europe and America, edited with Gabriel Dupuy, won the 1988 Abel Wolman Prize of the Public Works Historical Society; his book, The Search for the Ultimate Sink: Urban Pollution in Historical Perspective, was named an “outstanding Academic Book for 1997” by Choice; his edited volume, Devastation and Renewal: An Environmental History of Pittsburgh and Its Region, received a Certificate of Commendation from the American Association of State and Local History in 2004; and, his co-authored book, The Horse in the City: Living Machines in the 19th Century, was awarded Honorable Mention in 2007 for the Lewis Mumford Prize of the Society for City and Regional Planning History. He is co-editor with Martin V. Melosi of the University of Pittsburgh series, “The History of the Urban Environment.” He served as President of the Public Works Historical Society in 1982-83 and as President of the Urban History Association in 1999. He has served on National Research Council committees dealing with issues of urban infrastructure, public transit, water pollution, and the Human Dimensions of Global Change. “Toxic Legacy: The Impact of the Manufactured Gas Industry on the Environment,” Technology & Culture, Jan., 2014, 55:107-147. “Pittsburgh as an Energy Capital: Perspectives on Coal and Natural Gas Transitions and the Environment,” in Joseph A. Pratt, Martin V. Melosi, and Kathleen A. Brosnan (eds. ), Energy Capitals: Local Impacts, Global Influence (Pittsburgh: University of Pittsburgh Press, 2014), 5-29, with Karen Clay. “Urban Environmental History,” in Frank Uekoetter (ed. ), The Turning Points of Environmental History (Pittsburgh: University of Pittsburgh Press, 2010), 72-89. “The City as an Artifact of Technology and the Environment,” in Martin Reuss and Stephen H. Cutcliffe, The Illusory Boundary: Environment and Technology in History (University of Virginia Press, 2010), 145-170. “Pittsburgh Rivers: From Urban Industrial Infrastructure to Environmental Infrastructure,” with Tim Collins and Edward K. Muller, in Christof Mauch and Tom Zeller (eds. ), Rivers in History: Perspectives on Waterways in Europe and America (Pittsburgh: University of Pittsburgh Press, 2008). 41-62. The Horse in the City: Living Machines in the 19th Century (co-author, Clay McShane), Baltimore: Johns Hopkins University Press, 2007. Awarded Honorable Mention for the Lewis Mumford Prize of the Society for City and Regional Planning History, 2007. “Pittsburgh’s Industrial Corridors,” in Barbara Jones (ed. ), Born of Fire: The Valley of Work (Pittsburgh: University of Pittsburgh Press, 2006, with E.K. Muller), 15-35. Contributor, Regional Cooperation for Water Quality Improvement in Southwestern, Pennsylvania (Washington: National Academies Press, 2005). “The City and Technology,” in Carroll Pursell (ed. ), A Companion to American Technology (New York: Blackwell Publishing, 2005), 97-112. “Urban Horses and Changing City-Hinterland Relationships,” in Dieter Schott, Bill Luckin, and Geneviève Massard-Guildbaud (eds. ), Resources of the City: Contributions to an Environmental History of Modern Europe (London: Ashgate, 2005), 48-62. “The Decline of the Urban Horse.” Journal of Transport History (with Clay McShane), 24 (Sept., 2003), 177-199. Editor, Devastation and Renewal: An Environmental History of Pittsburgh and Its Region (University of Pittsburgh Press, 2003, ppb. 2005). “The Metabolism of the Industrial City: The Case of Pittsburgh,” Journal of Urban History 28 (July 2002), 511-545." Industrial Waste Disposal in the United States as a Historical Problem,” Ambix: The Journal of the Society for the History of Alchemy and Chemistry 49 (Mar. 2002), 4-20. “The First Federal Drinking Water Quality Standards and Their Evolution, 1914-1974,” in Paul S. Fischbeck and R. Scott Farrow (ed. ), Improving Regulation: Cases in Environment, Health and Safety (Washington, DC: Resources for the Future, 2001), 43-69, with Patrick Gurian. “Urban History and Environmental History in the United States: Complementary and Overlapping Fields,” in Christoph Bernhardt (ed. ), Environmental Problems in European Cities of the 19th and 20th Century (New York/Muenchen/Berlin: Waxmann, Muenster, 2001), 25-39. “Transforming An Energy System: The Evolution of the Manufactured Gas Industry and the Transition to Natural Gas in the United States (1807-1954),” in Olivier Coutard (ed. ), The Governance of Large Technical Systems (London: Routledge, 1999), 19-37. “Environmental Activism, Locomotive Smoke, and the Corporate Response: the Case of the Pennsylvania Railroad and Chicago Smoke Control,” Business History Review 73 (Winter 1999), 677-704, with David Stradling. “At the Intersection of Histories: Technology and the Environment,” Technology and Culture (Oct., 1998) 39: 601-640 (with Jeffrey Stine). Also available at www2.h-net.msu.edu/~environ/ historiography/ustechnology.htm with an updated postscript. “The Centrality of the Horse in the Nineteenth-Century American City,” with Clay McShane, in Raymond A. Mohl (ed. ), The Making of Urban America (New York: Scholarly Resources, Inc., 1997). “Women as Home Safety Managers: the Changing Perception of the Home as a Place of Hazard and Risk, 1870-1940,” in R. Cooter and B. Luckin (eds. ), Accidents in History: Injuries, Fatalities and Social Relations, The Wellcome Institute Series in the History of Medicine (Amsterdam: Rodopi, 1997), 196-233, with Mark Tebeau. The Search for the Ultimate Sink: Urban Pollution in Historical Perspective (Akron: University of Akron Press, 1996). “Patterns and Policy Choices in Infrastructure History: The United States, France, and Great Britain,” with Charles Jacobson, Public Works Management & Policy 1 (July, 1996), 60-75. “Managing Danger in the Home Environment, 1900-1940,” with Mark Tebeau, Journal of Social History 29 (Summer, 1996), 797-816. “Searching for a 'Sink' for an Industrial Waste: Iron-Making Fuels and the Environment,” Environmental History Review 18 (Spring, 1994), 9-34. “A Historical Reconstruction of Carbon Monoxide and Methane Emissions in the U.S., 1880-1980,” in R.U. Ayres and Udo E. Simonis (eds. ), Industrial Metabolism: Restructuring for Sustainable Development (Tokyo: UN University, 1994), 194-238, with R.U. Ayres. Technology and the Rise of the Networked City in Europe and America (Temple University Press, 1988), co-edited with Gabriel Dupuy. “The Evolution of American Urban Technology,” Journal of Urban Technology, 1 (Fall 1992), 1-19, with Josef Konvitz and Mark Rose. “The Greatest Bridge Never Built” American Heritage of Invention and Technology, 5 (Fall, 1989), 25-29, with Steven J. Fenves. Reprinted in the Pittsburgh Press Sunday Magazine, Jan. 14, 1990. “The City and the Telegraph: Urban Telecommunications in the Pre-Telephone Era,” Journal of Urban History 14 ( Nov., 1987), 38-80, with T. S. Finholt and D. Goodman. Reprinted in Stephen Graham (ed. ), The Cybercities Reader (London: Routledge, 2003). “Curriculum in Applied History: Toward the Future,” The Public Historian, 9 (Summer 1987), 111-125, with Peter N. Stearns. “Industrial Wastes and Public Health: Some Historical Notes, Part 1, 1876-1932,” American Journal of Public Health, 75 (September 1985), 1059-1067. “Water and Wastes: A Retrospective Assessment of Wastewater Technology in the U. S., 1800-1932,” Technology and Culture 25 (April, 1984), 226-263, with J. McCurley F.C. McMichael, and T.F. Yosie. “History and Public Policy: A Conversation with Joel A. Tarr,” Interview by Bruce M. Stave, in Journal of Urban History 9 (February 1983), 195-232. “The Mill Town in the Industrial City: the Case of Hazelwood,” Urbanism Past and Present 7 (inter-Spring, 1982), 1-14, with D. DiPasquale. “Applied History: A New/Old Departure,” The History Teacher, V. XIV, (August 1981), 517-31, with P. Stearns. “Changing Fuel Use Behavior and Energy Transitions: The Pittsburgh Smoke Control Movement, 1940-1950 A Case Study in Historical Analogy,” Journal of Social History 14 (Summer 1981), 561-88, with B. Lamperes. “Disputes Over Water Quality Policy: Professional Cultures in Conflict, 1900-1917,” American Journal of Public Health 70 (April, 1980), 427-435, with Terry Yosie and James McCurley, III. “The Separate vs. Combined Sewer Problem: A Case Study in Urban Technology Design Choice,” Journal of Urban History 5 (May, 1979), 308-39. The Impact of Transportation Innovation on Changing Spatial Patterns: Pittsburgh, 1850-1934 (Public Works Historical Society, 1978). “Historical Decisions About Waste water Technology, 1800-1932,” American Society of Civil Engineers, Journal of Water Resources Planning and Management 103 (May, 1977), 47-61, with F.C. McMichael. Retrospective Technology Assessment of Waste Water Technology in the United States: 1800-1972. A Report to the National Science Foundation/RANN. J. A. Tarr, Project Manager and Co-Principal Investigator, F. C. McMichael, Co-Principal Investigator, et al. (Carnegie Mellon, October, 1977). “From City to Farm: Urban Wastes and the American Farmer,” Agricultural History 49 (October, 1975), 598-612. A Study in Boss Politics: William Lorimer of Chicago (University of Illinois Press, 1971).